Submitted by Norm Roulet on Tue, 10/31/2006 - 04:51. 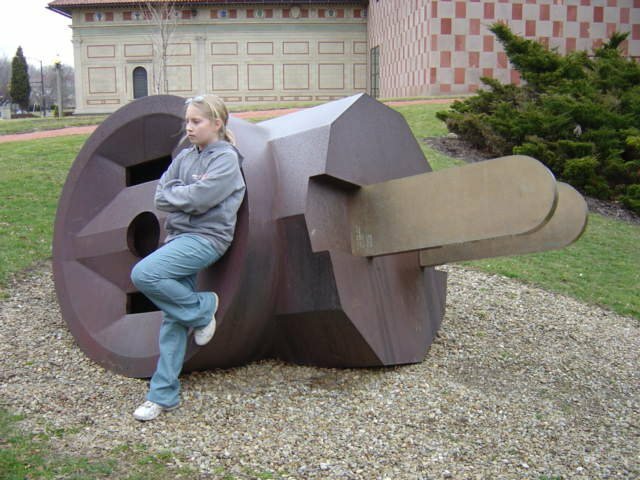 One of my favorite sculptures by one of my favorite sculptors is "3-Way Plug" by Claes Oldenburg, in a little pocket park to the right of the main building at the Allen Museum in Oberlin, seen above. 1 of 3, constructed in 1970, this is a great pop piece in a perfact setting. Check it and the Allen and Oberlin all out - great scene! BTW, while there, they have a Frank Lloyd Wright, and Oberlin's Conservatory of Music and the College's King Building were designed by World Trade Center architect Minoru Yamasaki to name a few highlights. how any town can become bike friendly. Weapons of Mass Construction " Paradigm Shift "